Instagram is a bit of the Wild West when it comes to social media. It's still new, fresh, and exciting. Anybody and everybody are sharing their photos for many different reasons, and there isn't a whole lot of "governing." After all, that is a bit of the draw to it when you're not running a business. And just like the Wild West, people are finding their way around and testing the waters for what proper social protocol is. 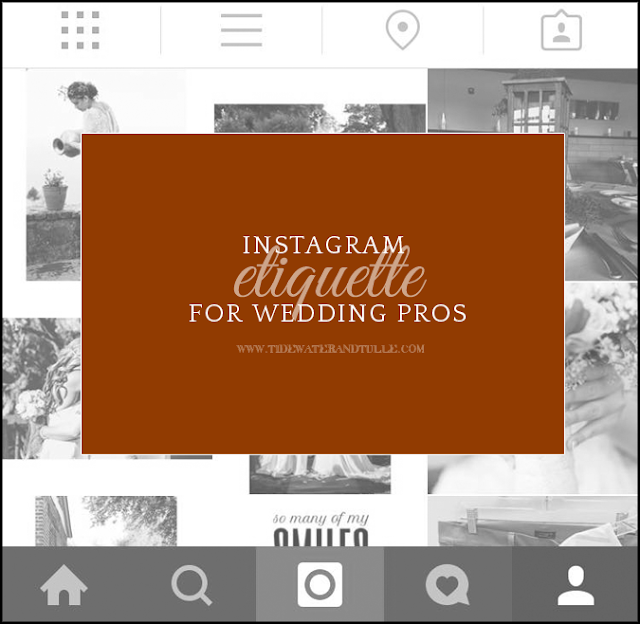 Well, lead wedding editors -- with a mixture of professional backgrounds from wedding pros, marketing gurus, tech innovators, and so much more -- are sharing their Insta-Etiquette insight with us today! As editors, we see a very large picture when it comes to the wedding world and social media as different brands and everyday people interact, and there's a common thread through it all: be authentic. "It might seem elementary, but you need to have an Instagram account! Some vendors think Instagram is just for bloggers or photographers, but there are numerous times I've only been able to list the florist, cake decorator, etc. instead of tagging them because they didn't have an Instagram account. Instagram is THE social media tool now, don't rely just on a Facebook!" When you are using someone else's content on your Instagram account, it is paramount you credit thoroughly, and that means with the creator's/photographer's IG handle as well as the relevant vendors within that photo. If the photo is of a wedding bouquet, then the photographer and the florist should be credited. If you can see something that someone made/contributed in that photo, credit them! It's not just industry standard, it's good karma thing to do. Weddings are teamwork. Support that community spirit. Consider a dedicated Instagram account if using for business. "Have a separate account for your business! But if you only use Instagram for personal photos, make it private to avoid confusion. Too many times vendors have one public account, and it's a mishmash of personal stuff and professional photos. It always bums me to tag a vendor who has irrelevant photos that don't make it obvious the vendor is a wedding vendor or business." Include all vendors' handles in submissions. "It takes extra time but get as many vendor Instagram handles as possible to include in your own Instagram post or to pass along to the publication to use. From a publisher's standpoint, it helps tremendously to get all vendor handles with a submission, so we can give credit where credit is due. If you're submitting via Two Bright Lights, include it at the end of your Album Story. If by email or online form, include it wherever there is an empty box with an indicator that they are the vendors' handles." If using for business, have a public account. "If you're using your Instagram for any business-related photos, avoid having an account that is 'private.' No one can see your work!" "When using hashtags, choose wisely and with intention. It's good practice to research popular quality hashtags for the type of graphic/photo you're sharing. Just don't over hashtag! OMG with the endless paragraph of hashtags after a post (and even as a seperate comment). It clutters up people's feed and makes you look spammy." Avoid tagging people in a photo if they're not in the photo. "Sometimes vendors tag other Instagram accounts in their photos to get that wedding pro's or publication's attention... but the photo isn't relevant or involved at all to that person. Instead, it's best to reach out by writing a nice comment on that person's own photo to network. We all want to connect, just try to do so in a non-spammy way!" Curate your own original content. "Be careful about "regramming" other vendors' work and not being clear about it. For example, if you're a styling company continually regramming other stylists' work and not your own. Promote your own products and services more than others. When you're not clear, it comes off as that being your creation and you will get into legal issues as well as marketing mixed messages." Promote yourself only on your own accounts. "Whether it is your own blog, or your business, it is hardly classy to advertise that under someone's Instagram post. We know sometimes running a business has its messy parts where we have to be shameless, but this is not one of them. Unwanted advertising is when someone leaves a comment like "For your photography needs visit www.mywebsite.com" without engaging the poster in any way at all. Many people would most likely delete your "ad" and could block you if you are one of those that participate in spamvertising (repeatedly posting such comments on multiple posts including those that are unrelated to your business)." Even when commenting, consider your brand. "I try to remember I'm representing my brand when I am commenting under or tagging my friends in things I like. I curse a lot in my regular life but definitely don't do that on my Aisle Perfect Instagram even when commenting on other people's things. As Aisle Perfect, I only "like" wedding related stuff, so I don't comment or double tap on twerk videos (even though that's what I spend half of my time doing on my personal account... lol)." Remember it is a social network; it's a two way street. When using it for business, it should appear as if you are present and involved in your Instagram community. Having a huge gap between the number of "followers versus following" gives the impression of a one-sided show. Foster that community support system. You don't have to like everyone and everything (we do have busy lives! ), but following relevant businesses in your community means you have the desire to use Instagram for what it was created for: to connect. How has Instagram affected your business? Share below!